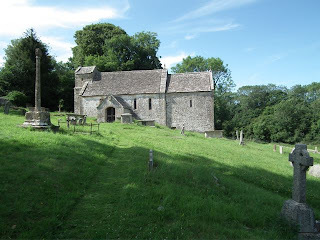 At about 4.15 pm I pulled into the lay-by at the entrance to the churchyard at Stretton Sugwas, made for the south door, turned the handle, and pushed. I always give a church door a good push – they're mostly heavy and need a bit of encouragement to open, unless some clever character has fitted a counterweight on the inside, in which case I heave at the door and fall rapidly inwards. But generally, I shove, and the door opens, slowly. This time, though, there was no movement. The church was locked. In the churchyard I found a friendly parishioner tending a grave. She told me that the church was usually open until 4 pm, but otherwise was kept locked. There had been thefts. You couldn't be too careful. When I tell people I do a lot of church-visiting, they often ask how many churches are locked. It seems that people assume that most churches are locked these days, the crime rate being what it is. They're surprised when I tell them that, although some places of worship are kept under lock and key, many churches are left open during the daytime so that worshippers and church-crawlers can come and go as they please. 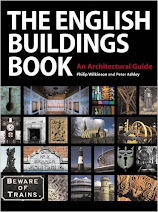 I'm rather surprised myself, especially as I'm currently reading the most recent issue of Conservation Bulletin, a twice-yearly publication produced by English Heritage that disseminates ideas and news about the historic environment. Most issues are on a specific theme, and this summer's theme is heritage crime. When it comes to churches, there are around 70 incidents per year in which valuable items (monuments, metalware, artworks, and so on) are stolen from churches. The churches themselves are fighting back, with more secure displays in churches, and more careful recording and photographing of items, to aid recovery if they go missing. Faced with the risk of theft, churches have few alternatives. Some churches are kept permanently locked. Some post a notice indicating the location of the key holder, so that visitors can collect a key. Some enlist volunteers to sit in the church. Some are kept open unattended during the day. For churches, though, the biggest crime wave in recent years has been nothing to do with locked or unlocked doors: it is metal theft – especially the removal of lead from church roofs. The figures are staggering. The church of England has some 16,000 churches, of which 76 per cent are listed; when one adds the smaller numbers of Catholic, nonconformist, and other places of worship the total is still larger. In 2011 one in seven of all England's listed churches suffered from metal theft. This figure has now been greatly reduced, for a variety of reasons – a decline in scrap metal prices; legislation regulating the scrap metal business; and security measures (such as the forensic marking of materials and the installation of roof alarms) taken by the churches themselves. As I admired the lovely medieval timber-framed tower at Stretton Sugwas (cousin to many other timber-framed towers in the west of England), and tried to conjure up in mind's eye the bit of Norman carving inside that I was not going to see that day, I consoled myself with the fact that at least the churches – with the help of government, technology, and the rest – are now organized enough to keep the metal thieves at bay. My interest in the work of the Doulton ceramics company, as featured in the previous post, alerted me to this building long before I actually managed to find it. It's easy to miss, because this part of London, where the Strand and Fleet Street meet, is full of rival architectural attractions, from the Law Courts and the church of St Clement Danes to the premises of Twinings, purveyors of fine teas. This richly decorated building began life as the Palsgrove Hotel, and its entrance lobby is a dazzling array of Doulton tiles decorated by John H McLennan. McLennan worked for Doulton for some 33 years, coming to their Lambeth factory at the age of 17 in 1877, while continuing his studies at the Lambeth School of Art. A mere year later he won a silver medal at an exhibition for a portrait of Handel on a ceramic plaque, and he continued to win prizes, as well as completing decorative schemes for prestigious Doulton clients such as the King of Siam and the Czar of Russia. His tiles for this hotel lobby form a riot of foliage, animal heads, figures, and ornate architectural details. A relief panel depicts fish disporting themselves amid sinuous waves and this theme is continued on the end walls, where flying fish with big wings and twisting tails stand out from niches. Above the fish, on a keystone, is the letter P for Palsgrove Hotel, in the fanciest Victorian script. I'm not sure of the significance of the fish – maybe the hotel had a fish restaurant – but the creature takes its place among a decorative ensemble that is at once exotic and typically Victorian in its richness of detail. If all these beasts and fish, flowers and leaves, capitals and keystones, were outstanding in a hotel, they seem even more remarkable in a bank, which is what this building became in 1895, when Twinings, who had diversified into finance and were running a bank from their neighbouring premises, took it over. Nowadays, it's a branch of Lloyds and offers customers a visual feast as they queue to use the cashpoint. There's more about this building at Caroline's Miscellany, here. Another backward glance, this time at the work of Doulton's ceramics factory in Lambeth, London. In Victorian England, Doulton pottery was everywhere. Doulton of Lambeth made drainpipes, sanitary ware, fireplaces, and all kinds of other practical wares. They also developed an enormous range of art pottery, employing men and women who trained at the nearby Lambeth School of Art to decorate jugs, vases, plates, and everything else you could make out of clay. Doulton artists and craftworkers also produced architectural ceramics, cladding and decorating the walls of factories, offices, hotels, and hospitals. The whole enterprise was a typically Victorian marriage of art and industry. 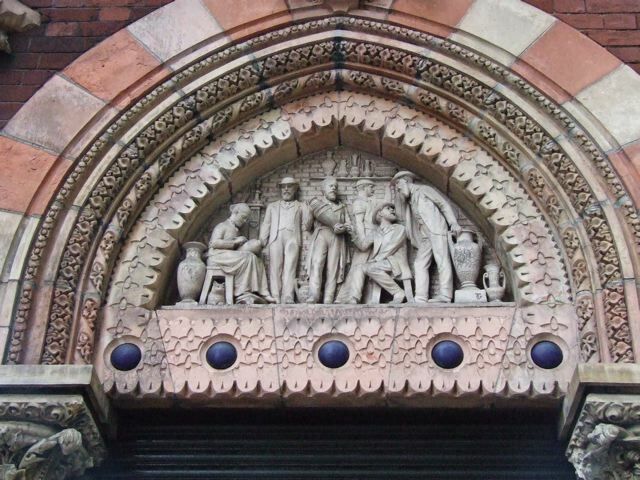 Only part of their Lambeth headquarters remains, and the highlight of the building is this tympanum celebrating the artistic side of the Doulton ethos. While Henry Doulton (the seated figure towards the right) explains what goes on in the studios, two of his top artists are on hand to show what they do. On the left, seated and working on a pot, is Hannah Barlow, who specialized in incised line drawings of animals. Her pet cat is just visible under her chair; she had a pet fox, too, but he didn’t live at work. 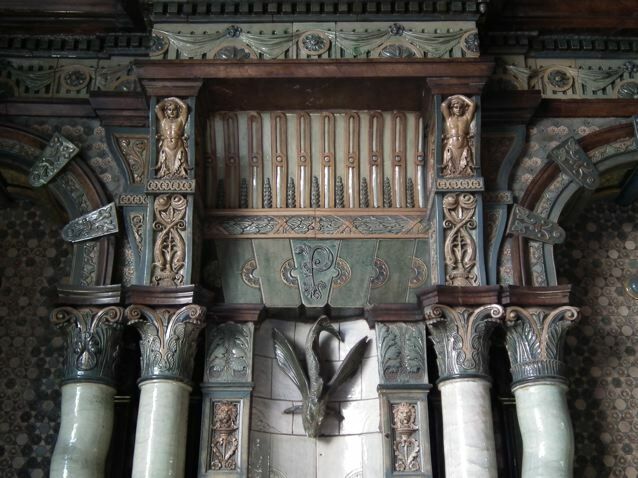 The bearded figure in the centre, holding a large urn, is George Tinworth, the virtuoso sculptor in clay who created this panel. His long and successful career for Doulton, producing figures, reliefs (often of Biblical subjects), decorated pots, and more, makes him famous among collectors. Tinworth Street, honouring his memory, is a couple of blocks away. The Lambeth works closed in 1956, but there is still a lot of Doulton ware around on English buildings from the mid-Victorian period to the 1930s. Their terracotta panels often show Victorian decorative art at its best, their tiles sometimes give expression to the swirling rhythms of the Art Nouveau – and their brewery plaques occasionally still point the way towards a good pint. Here’s to art and industry. Hannah Barlow (1851–1916) was Doulton's first female employee. She came to Doulton's in 1871 after her time at art school because her family had fallen on bad times financially and she needed to support herself. Among the jobs open to a young middle-class woman with artistic talent, one in the Lambeth studios of Doulton fitted the bill. Barlow was a trailblazer. She was soon joined by two of her sisters, Florence and Lucy (although I think Lucy did not stay long) – together with many other young women, some of whom stayed for many years, some of whom left the factory to get married. Several of Doulton's "star" decorators were women, and collectors still prize the work of Eliza Simmance, Edith Lupton, the Barlow sisters, and many others. Florence specialized in beautifully detailed colour images of birds, Hannah's forte was her incised line drawings. When John Ruskin visited the factory, he was enthusiastic about Hannah's work, and came away with a piece decorated with one of her illustrations of pigs. 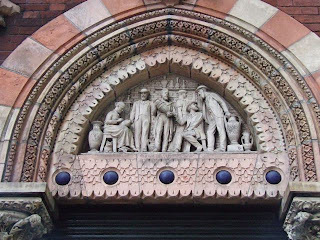 Doulton's were obviously proud of her work, and she earned her place on this relief panel above the entrance to their building. This backward glance focuses on an area of London in which I lived for a while. Its patterns of change and development still fascainte me. 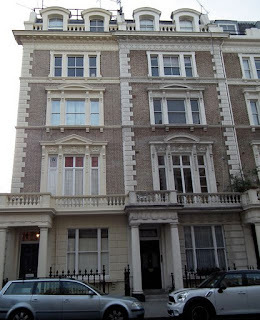 Living in London, as I did in the 1980s and 1990s, one could not but be aware of constant alterations to the built environment: not just the continuous additions to it in the form of the occasional good building amid the mass of new sub-architecture but also the cycles of change to older structures. This Clanricarde Gardens house brought these changes literally home to me – a grand house subdivided to provide more basic, but still very comfortable, accommodation for individuals, couples, and nuclear families. Some of the houses in the street had sunk yet lower, split into bedsits separated by flimsy partition walls and in some cases let to the very poor. 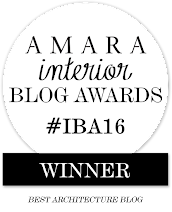 One of the bedsit-houses caught fire while I lived in the street, with tragic results. Nowadays, the street seems to have been gentrified (regentrified, I suppose). The flats into which the houses are divided are more luxurious than in my day and command impressive price tags. The cars in the street number many BMWs and their more modestly badged cousins, Minis. 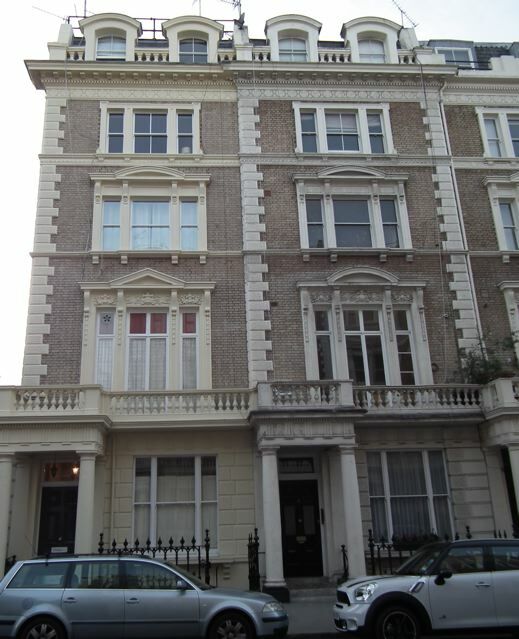 Residents with the money to afford it have realised the attractions of living here, in a relatively quiet spot near the heart of a great city. The cycle of change goes on. It's not far from the A417 (formerly the Roman Ermin Street) that roars its way between Gloucester and Cirencester, but you could be in another world. You drive along a remote lane past dry-stone walls and sloping sheep pastures. Here and there a still narrower lane branches off to a farm or a couple of houses, but there is little hint of a community that might support a church, indeed little hint of a church, if you miss the discreet sign and gateway. But for those who see the sign and stop, there’s something very special. A path of grass, the quietest of approaches, leads down to the church, and as you gasp at the tiny tower, you realise that the land slopes steeply away towards one of the streams that cuts its way into the limestone hereabouts. You make a sharp right turn after the second gate at the end of the grass path, and take in the way this little building clings to the slope. The walls have fragments of herringbone masonry – the angled arrangement of stones favoured by the Saxons – suggesting that this building was put up before the Norman conquest. The minute round-headed window in the chancel may well be Saxon, whereas the two slightly larger, taller lancets to the right of the porch were cut into the existing wall in the 13th century. The Saxon builders took advantage of the slope to build a tiny barrel-vaulted crypt beneath the chancel, and a later generation, probably in the 12th century, decorated the walls of that chancel with a simple pattern resembling masonry blocks, semicircular arches, and stylized flowers. The porch and tiny tower are later though. 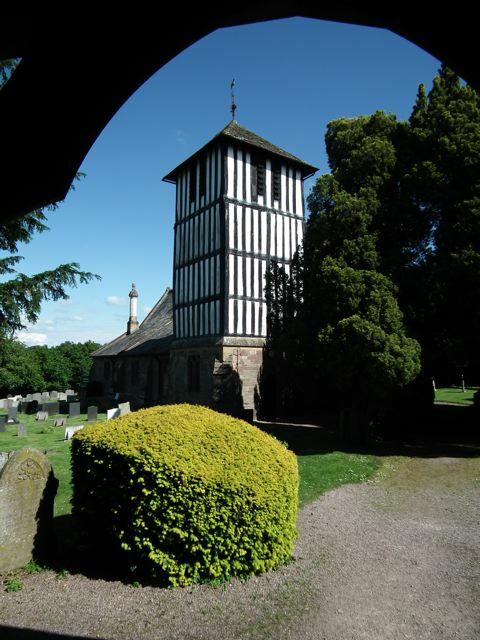 The tower actually bears an inscription telling us that it was built in 1587 by a mason called John Haden. It’s unusual for a church of this date to bear the name of its mason, and this is a far cry from the grander architect-designed “signed” buildings of later centuries. Part of the satisfaction of this place, indeed, comes form its very modesty and simplicity. And continuity. The idea that people have been coming hear for maybe 900 years to worship on the slope of the green hill, or to contemplate the cutting of stone and the passing of time. These reprises are partly about my personal responses to buildings when I first came upon them. From this point of view Duntisbourne Rouse is important to me as one of the very first parish churches I looked more than casually. It showed me how a humble building, low on architectural pretension, could still be aesthetically satisfying; that buildings (especially when as old as this one) are made up of historical layers – they are historical palimpsests, if you like, that repay attempts to read them; that site can be a major contributor to the form and effect of a building; and that it is worth peering through holes in hedges. I remember when I first stumbled across this place. Passing a knot of stone outbuildings and rounding a sharp bend, there was a high brick wall pierced with mullioned windows. 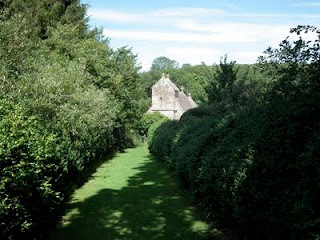 As we continued a little further and pulled up by the side of the lane, this beautiful front was revealed across a lawn. We had found Canons Ashby. All those years ago, the house looked neglected and sad. Walls were bowing. I think I remember weeds sprouting from the fabric here and there. We poked around a bit and a local woman appeared from a nearby cottage. 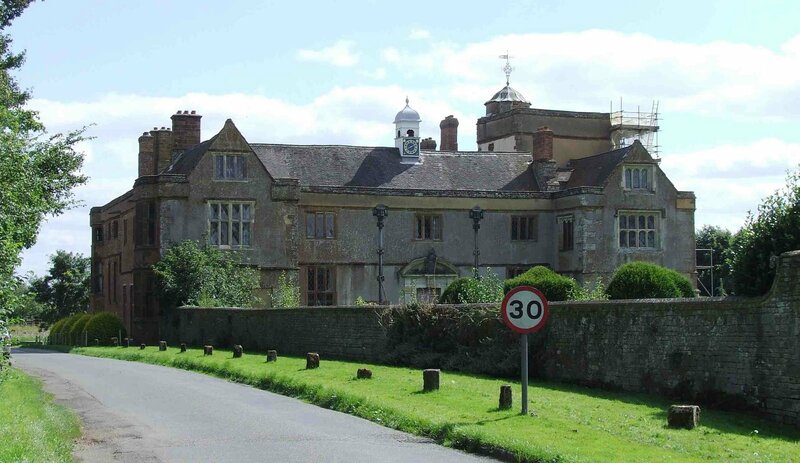 We learned that Canons Ashby was the ancestral home of the Drydens (the poet’s family), who had lived here since the 17th century, but who now lived in Africa. As the sun warmed the Northamptonshire stone and and brought out colours ranging from raspberry to apricot in the brickwork, the place looked magical. Inside, we were told, nothing much had changed for 250 years. And all this history looked as if it would soon turn into another ruin, another lost country house. That it did not do so was mostly due to Gervase Jackson-Stops, architectural advisor to the National Trust and a great scholar of and friend of country houses. Jackson-Stops not only fought to save the place, but also pioneered an arrangement under which government money was used to endow a house given to the National Trust – the first time the Trust had accepted a building with this source of endowment. The place has blossomed since it was taken under the National Trust’s wing in 1981. The dry rot is gone, the structure has been strengthened, and conservators working for the Trust discovered enchanting 16th-century murals under layers of paint, to add to delights ranging from elaborate plaster ceilings to the vast kitchen, which, until 1938 contained the only tap (cold, of course) in the house. The library even houses a signed copy of Sir Charles Grandison by Samuel Richardson, one of the fathers of the English novel. 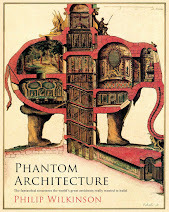 Apparently he wrote the book at Canons Ashby: another literary link. It’s heartening to know that the fragile beauty of this place has been saved. The third of my backward glances, taken because my current personal circumstances are limiting my travels in search of English buildings, pitches me back to the Cotswolds, the part of England where I grew up. 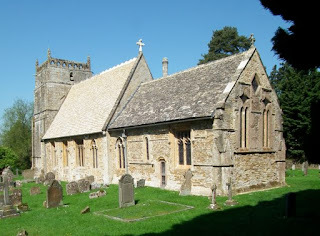 What follows is actually a reprise of two connected posts about the Oxfordshire village of Great Tew. 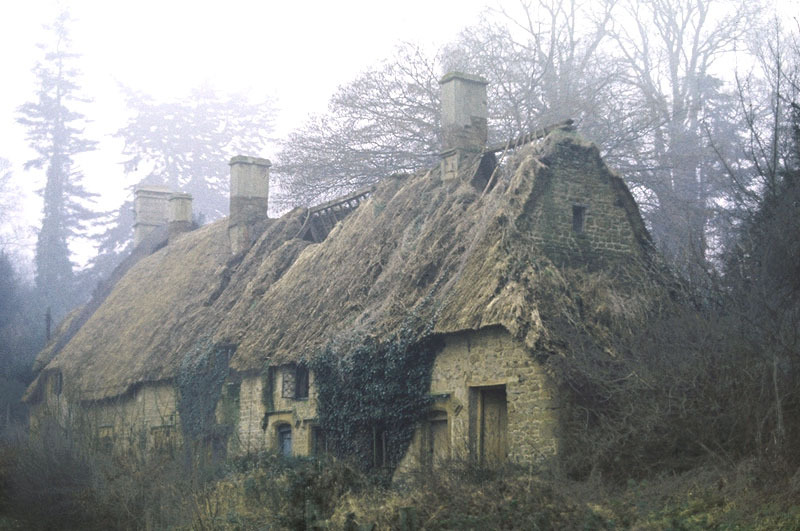 Great Tew is all like this – thatched roofs, glowing, almost toffee-coloured ironstone walls, evergreen trees and hedges, all tucked neatly away in deepest North Oxfordshire. It’s archetypal rural England, the kind of village that’s been here for hundreds of years, growing organically and acquiring more patina with each century. But that’s not quite the story. The village is actually the creation of the early-19th century, when the estate was remodelled and the village became a star feature in the landscape. 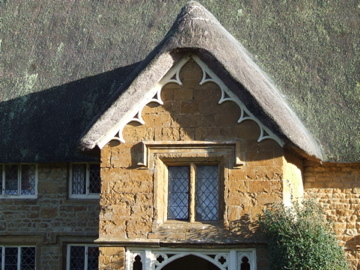 Thatched roofs were fitted or repaired, Gothic details added to the cottages, trees and hedges planted. The result is an uncanny combination of model estate village and old England. It’s not known for sure who masterminded the transformation, but the brain behind it might well have been landscape-gardener, writer, and horticulturalist J C Loudon. Loudon managed the estate for a few years and established a model farm. Whoever it was distilled the essence of the English village and left it in this North Oxfordshire valley. Several people responded to my post about Great Tew with memories of how the place used to be about thirty years ago – neglected, with tattered thatch, broken windows, and a few tenants hanging on amongst the dilapidation. I seem to remember that the Sunday Times of the Harold Evans era featured it in a piece about shamefully unmaintained villages left to go to ruin by their landlords. When I went there in the 1970s the plight of the residents was dire. It seemed to take one back to the debunking essays of Robertson Scott (England's Green and Pleasant Land was the ironic title of his most famous book) that showed country life in the early 20th century for what it really was – cold, hard, and painful for many. And yet the place had an eerie quality evocative of another time that no spruced-up picture-postcard village could ever have had. The lost domain. As far as I can remember, when I made that first visit there were already being efforts made to repair some of the houses and to put the village back on a sound footing. But the overwhelming impression was one of desolation. I knew that country life could be hard (memories of my grandparents in rural Lincolnshire involved bringing in pails of water from a spring, cooking on a coal range, oil lighting, and so on). But this was a far harder life. It jolted me into realization that country life was often far from idyllic and that warm stone could form a home to cold realities. The photograph of the dilapidated cottage comes from TrekEarth, here, with thanks to Liberal England for the original link.